In the olden days there were no performing Gurus. At least not in Bharatanatyam. As early as the Silappadikaram, there are references to male dancers. They were known by different names... like Koottan, Chakkai Koottan etc. In those centuries, diverse dance forms existed and each mode required different participants. Going by descriptions we know that what we call folk forms today were part of the list of dances prevalent. I don’t wish to go into Margi and Desi definitions. Each age had its own attitude to dance and we today can only conjecture what experts of those times thought about various modes. There seems to have been no divisions like classical, and folk. The skill for each mode was respected, recognized and honoured. This is my surmise after reading many texts. As late as the nineteenth century, in royal palaces and Zamindaris, male and female dancers were employed. Some may have been part of troupes performing group dances like Kolattam, and other forgotten acrobatic dances almost like street circus acts. The repertoire they performed was different. It is only in specific instances do we see records of the predominance of females, that is Devadasis, attached to the courts. They dominated the scene in a way that gave them a high status. They were performance oriented outside the temple and since they had several opportunities to perform in formal spaces, their repertoire became sophisticated and refined. 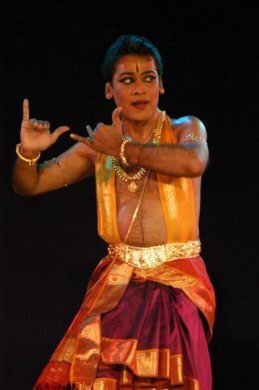 Male dancers at one point learnt Bharatanatyam..... at least the basics, to don the garb of a female and participate in the ritual dramas of Bhagavata Melam. They were originally given endowments of land and villages to be Bhagavatas. Later, these villages like Soolamangalam, and Melattur, faced a shortage of dancers even among the amateurs. Many left the villages and went for academics and jobs. With great difficulty the Melattur village resurrected the art, with members of the old families taking a keen interest. Coming home to roost, they took the lost threads and started performing. The music composed more than a hundred years prior to the modern Renaissance was kept alive by people just singing.....such is the beauty of those compositions. Modern days brought modern ideas....and male dancers doing Bharatanatyam became chic. Seeing old pictures of the likes of Uday Shankar, Ramgopal and others, one can say it was more than chic.....they were the glamour boys of dance! Their heydays were in the forties and fifties. And then came the students of Kalakshetra learning both Bharatanatyam and Kathakali. The trendy Dhananjayan started his school and became an inspiring pioneer. These boys....sorry young men, mostly from Kerala were, and to some extent, are still indispensable for the old dance dramas by Kalakshetra. Other gurus also took on male students and did a great job of training them. So now we have dancing male Gurus! That is very interesting because it looks like they can support their performances by teaching.... a good development indeed. And they travel everywhere teaching, composing shows for distant dance schools, and earning well. I wish them well and although I cannot name them all, I can say that I am impressed by dancing Gurus A. Lakshmanaswamy, Shanmugasundaram, both from the K.J. Sarasa school, Suryanarayanamurthy from Kalakshetra and Vempati school, L Narendra Kumar from Dhananjayans, Praveen Kumar and Satyanarayana Raju in Bangalore. They are well versed in the technique of dance, music, languages, and literature. What is more, they are eager to learn more! And surely they command respect from their students. I am yet to find out if they can sing as well. That would be a good asset.